very nice indeed. i bet it sounds shweeeet!!! cant wait to do mine. What options do you have for a belly pan?? 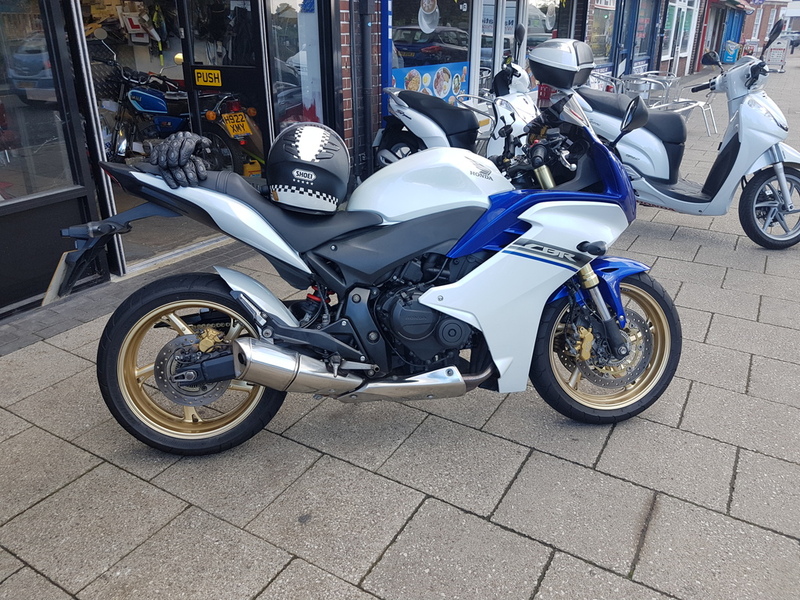 clean bike,that colour scheme was my back up option if i could,nt find a black in my price range,very tidy,what's the mileage ? Hi. I too have a CBR 600f, just joined here today. Noticed theres a few asking about belly pans, this company sells them. Jesters Tricks They don't look like they are part of the bike to me though. I'm after removing the stock exhaust on mine and replacing with a full Arrow or Akrapovic system. So removing the CAT. Has anyone done this, as will it require a Power Commander and messing with fuelling? I believe Wessa has done what you speak of. I don't think he mentioned anything about a PC though. I'm looking to do remove the cat and put a slip on too, so I'll await a more knowledgeable response. Ok great. Yeah it would be good to hear. I don't want to spend cash on a full system to find it's not actually having a positive impact on the bike, without the correct set up. Found this on youtube of a full Arrow system, sounds pretty nice! Last edited by CBR_600f; 10-27-2016 at 10:30 AM. now it sounds like a bike i went with black widow pipes which come in at around £300 with a 5 piece gasket set,1 gasket per header and 1 for the end can,Performance wise she is running a bit rich with a slight over fueling issue,only really aware of the issue at first start up when the choke is on.After less than a minute all good. The sensor from the ecu that fits into the down pipes seems to be doing an ok job of sorting the mixture out.Bear in mind if you go down this route tho a pc with installation,maps,set up etc is going to knock you £500-£600 on top of the pipes and end can,which is pretty expensive,best price i got was £420 + vat for pc3 fitted,mapped,or £460 + vat for pc5, not found the flat spot in the mid power range that some owners have,yet! Akrapovic can is awesome on the decats. Cheers for the reply. Yeah that does sound good in the video. Can imagine the neighbours loved it too! Yeah it would be good to see what they say during the service. I'd like to go with a full set up, but the cost of the power commanders and installation will definitely put it to nearer 1k if not more. Did you try just adding an end can before the down pipes? If so how did that sound? Does removing the cat and pipe changes make a difference to emissions when it comes to the MOT. Is it likely to cause issues in it passing? yeah went down the line of changing the end can first,i got a carbon diablus from sp engineering,it made a difference but not to much,the cat kills it all to be honest. better,the shorter the can the more noise it generates. Yeah i might buy the can first and give it a try. It would be nice to get the full set up, but if the tone is better then that's a start. Have you ever considered a quick shifter? They look like they would make riding a lot of fun. QuickShifter easy (new) - HealTech Electronics Ltd.
Also, any recommendations on a dark smoke screen for the bike? So far i've seen powerbronze make them and MRA. But MRA seem expensive for a windshield! Last edited by CBR_600f; 10-28-2016 at 04:01 PM.